P. Stenberg, E.H. Delucia, A.W. Schoettle, and H. Smolander, Photosynthetic Light Capture and Processing from the Cell to Canopy. R. Oren and D.W. Sheriff, Water and Nutrient Acquisition by Roots and Canopies. R.D. Yanai, T.J. Fahey, and S.L. Miller, Efficiency of Nutrient Acquisition by Fine Roots and Mycorrhizae. D.W. Sheriff, H.A. Margolis, M.R. Kaufmann, and P.B. Reich, Resource Use Efficiency. R.J. Luxmoore, R. Oren, D.W. Sheriff, and R.B. Thomas, Source-Sink-Storage Relationships of Conifers. S.T. Gower, J.G. Isebrands, and D.W. Sheriff, Carbon Allocation and Accumulation in Conifers. D.G. Sprugel, M.G. Ryan, J.R. Brooks, K.A. Vogt, and T.A. Martin, Respiration from the Organ Level to the Stand. S.G. Pallardy, J. Cermak, F.W. Ewers, M.R. Kaufmann, W.C. Parker, and J.S. Sperry, Water Transport Dynamics in Trees and Stands. Subject Index. Coniferous forests are among the most important of ecosystems. These forests are widespread and influence both the financial and biological health of our globe. 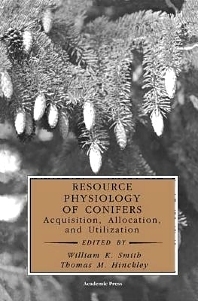 This book focuses attention on conifers and how these trees acquire, allocate, and utilize the resources that sustain this crucial productivity. An international team of experts has surveyed and synthesized information from an expanding area of inquiry. The first half of the book describes how resources are acquired both by means of photosynthesis and through root systems. The latter half of the volume focuses upon how resources are stored and used. As conifers continue as a resource and ever increasingly important contributor to the regional and global environmental sustainability, this book will help establish how much sustainability can be expected and maintained. Graduate students, faculty and researchers in ecology, forestry, plant sciences, physiology, and agronomy. University of Wyoming, Laramie, U.S.A.